The COMESA Court of Justice was one of the judicial institutions in the region that participated in a judicial transformation programme through digitization led by the Strathmore Law School of Kenya and global technology policy experts Access Partnership. The project aims to enhance the use of technology to transform the delivery of, and access to justice in Eastern and Southern Africa; and to build capacity of judges and other court stakeholders. 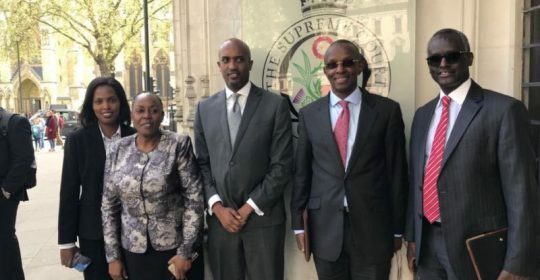 As part of this program, Strathmore Law School and Access Partnership organized for a number of judges and judicial information officers from across the region to attend a series of discussions and events in London on 26 and 27 April 2018. The CCJ was represented by Hon. Justice David Cheong (Mauritius); Hon. Justice Wael Rady (Egypt); Hon. Justice Bernard Georges (Seychelles); Hon. Justice Clotilde Mukamurera (Rwanda); and the Court Registrar Hon Nyambura Mbatia. In London, the judicial officers were engaged in a workshop themed: “Courts of the future: digital transformation of court systems in action” conducted by Access Partnerships. Among the subjects covered were: The Vision of Digital Justice, Improving delivery of public services through digital transformation and Paperless trials. The judicial staff were also conducted on a tour of the Supreme Court in London to witness first-hand the digital transformation of the justice system in action. In his invitation letter to the participants, the Dean of Strathmore Law School Dr. Luis Franceschi, described the study tour as an opportunity to get the perspectives of the UK judges, the challenges experienced through the transformation process, and share best practices. “This study tour presents a unique opportunity to exchange views with your UK counterparts who are experiencing the impact of how changes attributed to digitization and adoption of technology can improve judicial performance,” Dr Franceschi said. The mission will be followed up by a meeting in Nairobi on 23rd May, 2018 to further explore how the concept of Court of the Future will be implemented.